Home News Cheat India Trailer Out: Emraan Hashmi In A Never Seen Before Avatar. 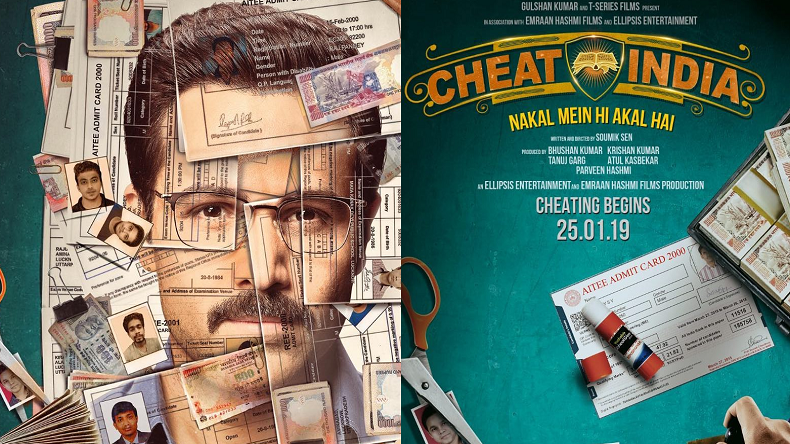 The poster of Emraan Hashmi starrer ‘Cheat India’ already increased the excitement levels among the public and now the recently released trailer has caused the excitement to reach the roof. The dialogue by Emraan in the end of trailer says,” Mujhe Hero baneki koi icha nahi hai, villain banne ka koi time nahi hai, khiladi hun, khel raha hun.”. This shows that how good Emraan’s character is at being the Robinhood and making money. The subtitle of the movie simply tries to point out the reality that exists right here right now. The movie is reality check of the matter we have only seen in the news headlines in the form of a 2-hour movie. The trailer shows that the scams and its certification make the reality more complex than it seems. Emraan has nailed the charcter completely and proved his versatility in acting. The movie has Emraan Hashmi and Shreya Dhanwanthary in lead roles. The movie is written as well as directed by Soumik Sen. It is produced by Bhushan Kumar, Krishan Kumar, Tanuj Garg , Atul Kasbekar & Parveen Hashmi. Co-Producers are Vinod Bhanushali, Sunny Khanna, Shanti Sivaram Maini, Swati Iyer Chawla, Piya Sawhney. The film is set to release on 25th January,2019. Next articleStill From Kangana Starrer ‘Manikarnika’ Is Out- The ‘Queen’ Is Back Now As ‘Queen Of Jhansi’.